Yard sale shopping has been pretty much non-existent these last few weeks. With the constant rain we have had in south plus being out of town last week, it had been about 3 weeks since I had shopped at a yard sale. Last Saturday the rain let up for a few hours in the morning so on my way to the grocery store I thought I would see if anyone braved setting up at my parking lot yard sale I frequent. There were a few people there and I picked up a milk glass dish for 50¢ and a roll of jute webbing for 50¢. I am thinking a fall project may be in the works for that webbing. And I actually saw a yard sale when I was out yesterday and stopped and picked up a few goodies. A Coach sunglass case for 50¢, a fall Yankee candle for 50¢, and a pretty brown necklace for $1.00. Renee at Living, Laughing, and Loving picked up this chest at the end of her bed at Goodwill for super cheap! Love it! And oh my goodness, if you loved my Goodwill outlet post, you have to check out Marlin’s finds from a Goodwill outlet near her – except she got them all for FREE! 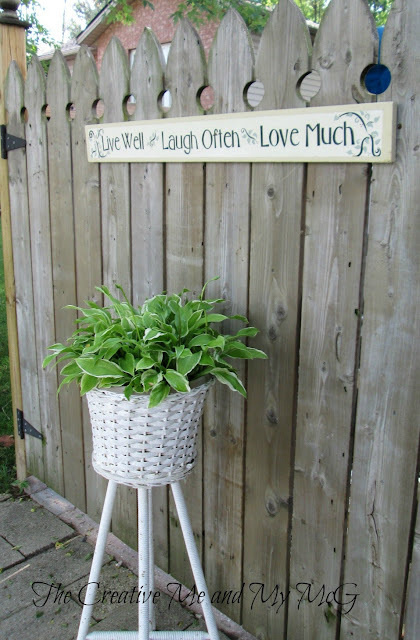 And Cheryl found this cute sign that she added to her back yard fence and a ton more fun stuff. Hoping for a good shopping weekend this week here! Please NO rain! Have you found any fun yard sale or thrift store finds recently? Christina – thanks so much for featuring my sign – I really love it! I have linked up last weeks finds – and I am making my list for this weekend’s adventures – I hope you are able to get out there this week! Cheryl @ The Creative Me and My McG recently posted..Weekend Finds! I’d love a chance to try this product in my veggie garden. Thank you! Thanks for sharing your recent thrifty finds. I found that same milk glass pedestal bowl at Goodwill recently – I love it! I really liked the burlap webbing and will be anxious to see how you use it. I just made a little project using a very similar milk glass dish to yours yesterday. I’ll have it on my blog in a week or two. Thanks for hosting. Take care ! I’m always on the lookout for non-toxic plant treatments and Worry-Free looks like quite a diverse product. Thanks for the chance to win, Christina. Thank you so much for hosting also for featuring my shopping cart diving ! I can’t believe it you pay 50 cent for that Coach sunglass case ! You found great stuff without breaking the bank 🙂 Have a blessed week ! Marlin recently posted..When Your Estate Sale Hunting Failed !! Hello! I’ve been following your web site for a while now and finally got the bravery to go ahead and give you a shout out from Huffman Tx! Just wanted to mention keep up the fantastic work!